If you’re lucky enough to have an amazing nanny, you likely want to do whatever you can to keep her happy in her job. The best way to do that is to show your genuine appreciation for all her hard work. Traditionally, giving a raise is the way employers says thank you to their caregiver, however, that isn’t always a realistic option in today’s economy. Here are some creative, inexpensive ways to say thanks and let your nanny know how much she means to your family. Actually say “thank you.” Sometimes the simplest gesture can be the most powerful. 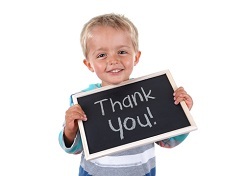 Offering a heartfelt thank you to your nanny can make a big difference in your relationship. Often we think people know how we feel, but unfortunately, they don’t always just know. Sitting down with your nanny and thanking her for taking such great care of your children and supporting you can truly make your nanny’s day. Include specific examples of things she’s done that were especially important to your family. It will mean a lot to her that you noticed her efforts and more importantly, that you took the time to share how you feel towards her. Give her extra paid time off. Time off, even a random afternoon in the middle of the week, is a special treat for nannies. Find time in your calendar to stay home with the kids or ask Grandma to come and visit for a day or two so your nanny can have some extra paid time off. Try and schedule the time so she can take a long weekend or do something fun like go to a local festival or to her child’s afternoon play. Another way to add to your nanny’s paid time off benefit is to give her additional vacation time when your family goes on vacation. Don’t require her to pet sit, house sit or catch up on household chores during this time. This extra vacation can make your job attractive year after year and is a wonderful way to say thanks for all her hard work. Offer her your frequent flier miles. If you travel frequently for business, chances are you’re racking up valuable miles that can be used to say thanks to your nanny. For your nanny, the cost of flying home, to a professional development conference or to a fantasy vacation destination can be expensive – sometimes so expensive that the trip is out of reach. By transferring your miles to her, you’re giving her something really valuable that doesn’t actually cost you anything. Make a special gift for her with your child. Your nanny helps your child make birthday, Mother’s Day, Father’s Day and holiday gifts for you. She knows that something handmade especially for Mom or Dad is a gift you’ll treasure year after year. Say thanks with a special gift just for her. It can be a fun Saturday afternoon project for you and your child. If you’re not crafty, you can visit a paint it yourself pottery store and let the staff help your child make something wonderful. Add a handwritten card and you’ll have a thank you gift your nanny will treasure. Buy her a special gift. If your nanny is dying to attend a local concert, get her two tickets. If she’s been eyeing a new scrapbooking paper collection, pick it up for her at the local craft store. If she’s been extra stressed out lately, let her enjoy a massage on you. Buying your nanny a special gift not only says you appreciate her, it also says that you pay attention to what she likes and needs. That caring attention will mean as much to your nanny as the gift itself. Let her use your luxury toys. Most nannies can’t afford the luxury items that your family may have. If you have a vacation home, a time share, great seats to the local baseball team, a subscription to the city’s symphony or other fun items, let your nanny enjoy them too. Often this doesn’t cost you anything because you can schedule your nanny’s use at a time when your family wouldn’t be taking advantage of the item anyway. This is a unique and fun way to say thanks to your nanny and allow her to enjoy experiences she normally wouldn’t get to. Saying thank you to your nanny is one of the most important things you can do to keep her happy in your position. There are plenty of ways you can show your appreciation that won’t break the bank and will make a lasting and happy impression.